Vaccinations are absolute essential for a trip to Africa, no matter in which country. The tropical institute recommends vaccinations against tetanus, diphteria, yellow fever, poliomyelitis and hepatitis A. For long term stays, trekking trips or under generally bad hygienic conditions, additional vaccinations against hepatitis B, typhus, hydrophobia and meningitis, and as well against measles for children in every age is recommended. The vaccinations are not cheap, but some health insurance companies repay the costs by presenting the receipts. Kenya is a malaria area and unfortunately there are no vaccinantions yet for this disease and the opinions of the experts about side effects of prophylaxis differ widely. Further information is available at your local tropical institute or ask your trusted doctor. Be sure to always have enough of insect repellent, sunscreen, prescription drugs, diarrhea tablets and some bandages. Documents like ID’s, passports (especially after arrival with visa stamp), insurance-, credit and debit cards should be scanned and photo-copied several times. Save the scans on an USB-stick and leave the photo-copies in your luggage. Flights from Europe to Kenya are offered daily by most major airlines. From Frankfurt, Berlin and Munich you can reach both, Mombasa and Nairobi. The flight time is approximately 7.5 hours and the time difference in summer is one hour and in winter two. On arrival, stays under 30 days requires a visa. The visa is given at the time of arrival and costs 25.00 U.S. dollars. The presentation of the passport and return- or onward ticket. The passport must be valid at entry for at least 6 months. Children need a children’s passport or must be registered with a parent’s passport. 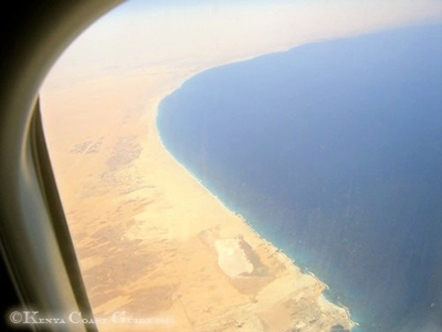 The Climate on the coast is hot and muggy and is constantly around 30˚Celsius with about 70% humidity. Therefore, wear light and loose cotton clothes and solid but comfortable shoes since outside the city a lot of roads are widely unpaved except main roads. In the evening you should wear a jacket, pullover or cardigan, long trousers and long sleeved tops and socks because of mosquitoes. A special insect spray for clothes is also recommended. The national currency is Kenyan Shilling (KES). Foreign currencies are allowed to be imported in unlimited amounts. In the case of long term stays it is possible to open an Euro/US-Dollar account at a local major bank. One Euro is approximately 100 KES. US-Dollar are likely seen, but most of the locals do not know the current value of the currency. 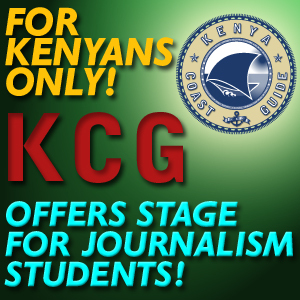 Therefore, to avoid unnecessary discussions, it‘s better to pay in KES. Don‘t change too much in advance to avoid a higher loss by changing it back to your own currency. It‘s recommended to calculate for a few days or a week and change then again. Please change only at banks or licensed hotels. Exchange is also offered in the streets to mostly a better course but it is illegal and the benefit is not that high. Cash machines are available at most banks and bigger shopping centers, for instance NAKUMATT in Nyali. Credit cards like MasterCard, VISA, AMERICAN EXPRESS, AMEX or Diners Card are normally accepted in hotels, lodges and better restaurants. At customs electronical devices have to be declared. If you carry several cameras or laptops a deposit may be required. The same applies for valuable sports equipment or musical instruments, etc. It is permitted to import 200 cigarettes and 0,7 liters of alcohol. The return flight has to be confirmed 48 hours in advance by your airline. The confirmation can be done at the local office or online on the website of your airline. The front desk of your hotel will also be pleased to help you. In the restaurant – and actually anywhere else – Kenyans appreciates very much if one is changing the muscle-shirt, the sandals, the 3/4-trousers against trousers for adults, shoes which deseve the name and an ironed shirt. A waiter or bartender will tell you though never directly, but one feels that beach clothes in bars and restaurants are completely misplaced and tasteless. So do yourself and your surroundings a favor and care about what you wear. One will thank you unsaid. 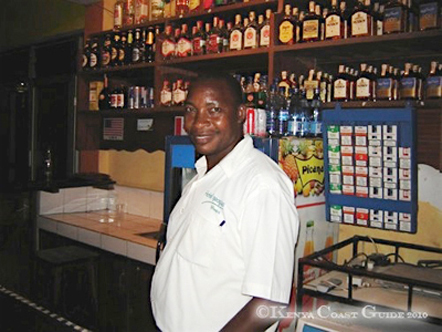 The nightlife in Mombasa is colorful and varied. In the city there are numerous clubs and discos with live music and for a curfew you will wait in vain. You can easily party until the sun rises and then go directly to breakfast. Not only in the inner city, also outside of town along the North Coast Road are enough occasions to party. From Nyali, along Bamburi Beach up to Shanzu Beach there are plenty of hotel facilities and in the immediate area to find plenty of discos, clubs and bars. Especially in clubs with younger guests it can happen that there are a few more drinks on the bill than had been ordered. This is practiced occasionally in some establishments with tourists and it‘s quite easy for the staff because there are no personal accounts. All ordered drinks are listed on a collective bill. However, it is recommended not to ask for the manager immediately. It‘s much better to inform the service staff about the mistake in a calm and polite way and to thank them with a small tip. Of course it‘s not very wise to discuss two or three falsely charged drinks when the whole table is overflowed with empty glasses and bottles. Actually, austerity is always recommended unless you don‘t mind when you get duped. For those who are above the age of jam packed discos and dancing the nights away and prefer a more calmly place will also find enough fancy bars and live-music-clubs. You get excellent mixed cocktails according to international standard at the bar or you can retire for the evening in some secluded sitting areas. The audience is also a mix of young and old, black and white – what matters only is having a good humor and to enjoy the music, to dance and to flirt. Flirt – by the way is absolutely necessary to mention here because you won‘t get away without flirting even if you are too shy and by nature more the type ’cold like fish’. No matter if you are a lady or a gentleman, you will not stand at a bar alone for longer than 5 minutes. Especially the beautiful Kenyan ladies are always looking for a generous ’Mzsungu’, which is you and means ’the white’. The ladies are quite offensive and target-oriented and the more expensive the establishment the more classy and more decent are the ’Malayas’ – who are the ladies and means ’prostitute’. It‘s like in all developing countries – the border to prostitution is fluent. With such high unemployment the vacationers are seen pragmatically as an additional source of income. Many of these ladies are also married and do what they do with the permission of their husbands. You can get to know a really lovely lady,who is absolutely serious about you and who is honest and faithful, but usually only for the duration of your stay. Which doesn‘t mean that it‘s absolutely impossible to find one‘s honest happiness. All of this, of course is not only meant for the white gentleman, for the white ladies from Europe or in general from the western world it‘s absolutely the same. In any case you should be careful especially in discos or clubs which are not that classy, with who you are planning to spend the night with. There has been enough who‘s way didn’t end in the hotel with his lady, but woke up instead at the beach with no memory – and, of course, without cash and valuables. According to this it’s always recommended to book a taxi driver of your trust. Ask at your hotel reception, they will be happy to help. Get advised by the driver. He knows all the clubs and bars and will also give you his phone number to pick you up again or to continue the tour. In any case, please negotiate the price always before the ride and from stage to stage.